Peru, Ca. 1000 to 1450 AD. This large, airy Chancy textile is bright and colorful, painted with both skill and whimsy. The textile was woven first from plain beige cotton weave and the paint applied to the surface in the form of colorful natural pigments. The sun that is depicted has cheerful red, yellow and blue bands surrounding it, as well as alternating red and blue rays and a joyous smile. 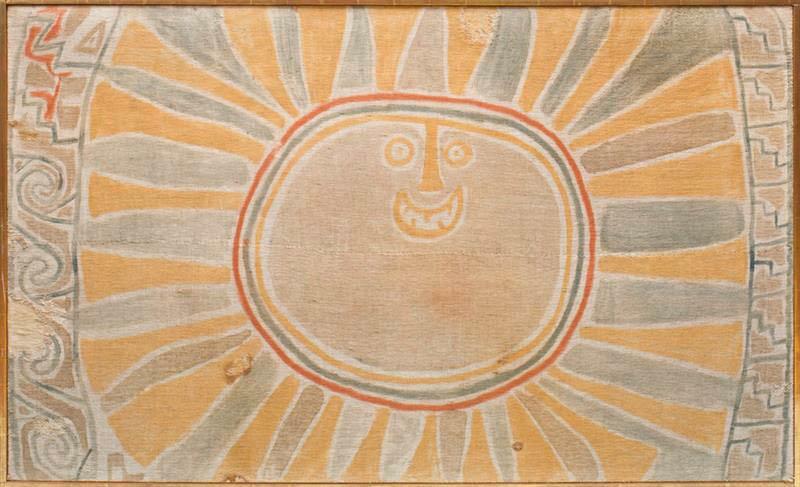 Suns and sunburst motifs are a recurring theme in Pre Columbian textiles, no doubt a testament to the religious and life affirming power of the sun. Size: 45 1/4 x 72 1/2 in. W.
Statement of provenance: The textile was purchased from Gary Ford. Gary Acquired it from a New York estate liquidator. The only information he could give was that it was in the collection of a Manhattan contemporary art collector and they had it for some time, likely since the 1970s. The framing and mounting can be safely dated to the 1980s. Although this textile appears simple in nature, the labor and craftsmanship required to produce the string and weave it by hand at such a gossamer thin level was quite intense, as was the labor required to create the rich pigments used on the surface. As a result, textiles such as these would have been reserved only for either very wealthy Chancay individuals or for those with the highest ranking status, such as patrons or state officials. This textile was created during the Late Intermediate Period (10001476 CE) prior to the rise of the Inka Empire. The Late Intermediate Period is signified by a return to independent polities governing different areas of the region. The Chancay culture is renowned for its broad and complex range of textiles, which include highly sophisticated animistic motifs portraying nature, animal spirits and chimeras, and anthropomorphized animal totems. The Chancay were sophisticated in their reverence for artists individual creativity, as opposed to other Pre-Coumbian cultures who viewed artists as artisans expected to create standardized objects repeating the same motif numerous times. Instead Chancay artists were more free to experiment and create vivid, often psychedelic compositions in a breathtaking array of styles, colors, and motifs. These textiles were often used in religious or ceremonial gatherings during which a variety of sacred spirits in nature were worshipped, possibly with the assistance of psychotropic substances, in particular, psilocybin. This trend of freely painted yet controlled and skillful psychedelic imagery persists throughout modern times, and seems to be a common impulse that endures among artists throughout time. One such example is the artist Keith Haring, whose skill as an artist combined with the freedom of a psychedelic fancy creates tumbling, spiraling free-form compositions that are fascinatingly reminiscent of many Pre-Columbian textiles. Like Pre-Columbian textiles, his compositions have an elusive figure-ground relationship, in which the figures seem to mesh and merge with the background in a field of apparent motion, fitting seamlessly into one another with a sense of unity that is not present in most Western art with a clearly delineated figure-ground relationship. A close parallel is illustrated (plate 12) in The Emperors Old Clothes: Textile Art from Ancient Andean Civilizations; Essay by Anne Paul and Susan A Niles, exhibition at The Gallery at The State Theatre Center for the Arts, 1992. Ancestors of the Incas, The Lost Civilizations of Peru by Kauffmann-Doig, Presented by Wonders. Ancient Peruvian Textiles, by Jose De Lavalle and Rosario De Cardenas. Integra AFP, 1999. Textile Art of Peru. Mario Vargas Llosa. Industria Textil Piura, 1991. To Weave for the Sun: Ancient Andean Textiles, by Rebecca Stone-Miller. Thames and Hudson, 1992.